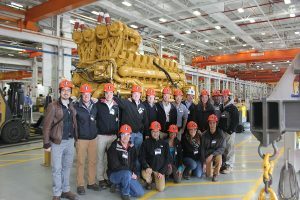 An early morning marked the beginning of the Global Leaders in Construction Management spring trip to St. Louis, MO. With fresh memories of Brazil from a previous trip still remaining, GLCM swapped international travel for an experience a little closer to home. 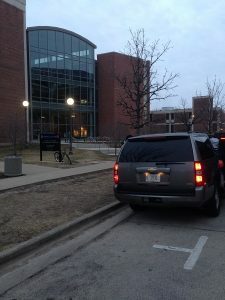 This time around the rendezvous was the Newmark Civil Engineering Building in Champaign-Urbana, the mode of transportation was two university vehicles, and the need for a group translator was gone. With a blazing red sun rising over the Midwest, the group hit the road with high hopes for a St. Louis themed week filled with visits to the offices and jobsites of companies like Albericci, ARCO/Murray, Clayco, Korte, McCarthy and Walsh. The first visit of the trip was to a Caterpillar plant in Decatur, IL. 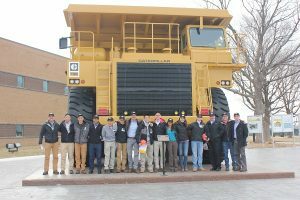 Caterpillar leads the world in manufacturing construction and mining equipment and has its headquarters in Peoria, IL. The Caterpillar plant in Decatur has existed since 1955. Today, the factory manufactures motor graders, hydraulic scrapers, and off-highway trucks. This manufacturing process is done in two main steps: fabrication and final assembly. The first half of the GLCM visit was through the factory floor. A few years ago, Caterpillar spent approximately $400 million to rebuild its new fabrication and assembly areas. In the fabrication area, heavy machinery parts are welded into form. The welding effort is so large at this plant it makes it the largest consumer of welding products among factories in Caterpillar–a company that is already the largest consumer of welding products in the world. After pieces have been welded by either craft workers or robotic machines, the quality of welds are checked using an ultrasonic test. After welding, the manufacturing process continues with fabrication, painting and assembly. In an effort to ensure consistent quality, Caterpillar implements a standard practice procedure throughout all of its manufacturing processes on the floor. Their thought is that the same tool doing the same job will yield the same result. This is especially important in a factory that employs nearly 5,000 employees during a peak year. 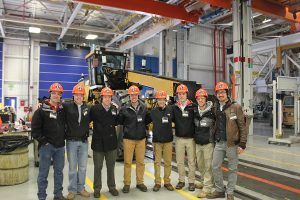 Any step in the fabrication or assembly of a piece of equipment can be traced to an employee and a time at which the process was performed.After leaving the fabrication and assembly areas, GLCM was warmly welcomed into a presentation and discussion with three experienced Caterpillar employees. It was here that Caterpillar discussed the supplier-customer relationship in regards to heavy construction equipment. Similar to buying a car, there are many variables that play into making a decision on purchasing heavy construction and mining equipment. For a large construction operation, the costs of ownership and operation must be considered along with the productivity gains that a piece of equipment can offer. Caterpillar has the ability to come alongside a customer and help them make the best purchase decision for a job. As it stands, Caterpillar sells around $50-60 billion of new equipment per year while an additional $50 billion revenue is from used, rebuild, work-ready, and core equipment. As Caterpillar construction equipment continues to be a familiar sight on many of the jobsites that GLCM visits, this visit proved to be incredibly helpful in seeing the story behind how such equipment is manufactured and what it looks like for a construction contractor to invest in such large equipment.